Today was a good day in regards to my eating. I decided to be proactive today. I knew I would want a yummy, greasy cheeseburger again today, so I went grocery shopping. Yes I know, it sounds dangerous, but read on :) I bought fat free ground chicken burgers. I made 2 delicous chicken burgers with lettuce, grilled tomato, 1/2 a slice of 2% cheese (each), and mustard. They were better than any burger I would have bought at a restaurant or fast food chain, and at a total of 350 calories, 4 grams of fat, and 2 carbs I didn't have to feel guilty. Go me! Then I was reading one of the blogs I follow "Project 365" and the writer had a great idea she calls it the "I Am Worth More Challenge"
This challenge is to promote and remind you that while the scale is a tool that can be used on this journey- it does not define your success NOR does it define you! 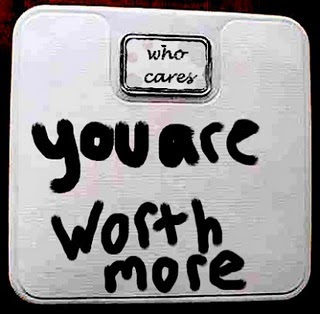 I PROMISE that if you can't love yourself for who you are as person at the weight you are at now, nothing will change when you reach your goal weight- YOU ARE WORTH MORE than what you weigh! 1- Get post it notes. 2- Every day that you do something to take a step toward your goal, write it on the post it note. Some examples might be: I didn't get cheese on my sandwhich, I chose to park at the furthest spot in the parking lot to get in some extra walking, I skipped Starbucks, I worked out today, I ate a healthy breakfast, I read blogs that I know encourage and inspire me. Write down ANYTHING that constitutes a successful decision that shows the change you are making. 3- At the end of each day take the post it notes that you have written your successful steps on and stick them on your scale. 4- At the end of the week (on whatever day you weigh in) your scale should (hopefully!) be completely covered with the good things that you have done for yourself and have gotten you closer to reaching your goal and you shouldn't be able to see the # on the scale at all. You will completely skip your weigh in that week. 5- Post a pic of your scale covered in post it notes to celebrate with the rest of us all of the REAL accomplishments that you made. When you are standing on the scale looking down you will be looking at all of the decisions that you made this week that should either make you feel proud or let you know that you aren't working hard enough- let it be THOSE decisions- not some # that fluctuates like the dickens, be what allows you to step off the scale with pride." I am going to do this, and I encourage you to as well! I think I might just do this weekly. Hungry, Hungry Hippo . . . . Misguided Values . . .
Wicked Witch of the East . . .